Quick and simple yet very satisfying. Delicious! Very quick and easy, bump up almond/olives for punchier couscous. Loved it. Great, quick dish, this has become a family favourite. Very easy, moist chicken, squeaky cheese and a lemony honey sauce! Really yummy - just watch the sauce, it goes from "thickened" to evaporated quite fast! Delicious! The pancetta infuses the chicken breast with a great smoky flavor. Next time I would add the chicken breast together with all the other ingredients right from the start since the pancetta was almost burnt after 40 minutes in the oven. Served with oven potato wedges. Quick and easy way of using leftover chicken, but not a culinary highlight. Was just ok. Added some avocado and dry-roasted peanuts for crunch. Awesome easy Recipe for a great lunch. Fabulous quick dinner - very tasty! I tend to add more lemon juice and also Olives which seem to work well with the flavours. Flavour was very good but I preferred it with only 1 slice of pancetta. Also very good with back bacon (cooked separately). Very good and quick pasta dish. Will go into regular rotation. One of the rare winners with the whole family, weeknight-friendly. Love the tomato sauce, which consists of simply roasting tomato slices with garlic and olive oil, finally topped with ricotta filled pasta shells and lots of cheese. Add a little dill to make this recipe shine! Nice enough pasta dish, do use the Taleggio cheese otherwise a bit bland. Good, but not great. I did, accidentally, use sweet chill sauce instead of the chill jam stated in the recipe. Serving size is small, lucky none of us were particularly hungry!! An excellent side dish that is very easy to put together. Easy to put together and quite tasty but with so few ingredients, you do want to use the most flavourful you can find, especially the mushrooms which are really the star. And don't forget to season the ricotta. I used frozen puff pastry and made single serving tarts. Delicious - used danish fetta and toasted almonds, served with chicken. Yum, yum, yum. Creamy salty labne, sweet but savoury root vegetables & crunch from the hazelnuts - an absolute winner. Bit bland - needs more sauce of some kind. A great easy weeknight meal that is quick! The sauce in particular is excellent and would make a good salad dressing. This is divine. Marinate chicken for a few hours. After chicken cooked takes no time at all to prepare the bread,leaves and lemon mayo. Has satisfied many adults and teenagers at a barbeque! Even my 7 yr old will attempt the chicken- although I also cook a plain piece of chicken for him as after a few bites his mouth is feeling the Chilli hit! 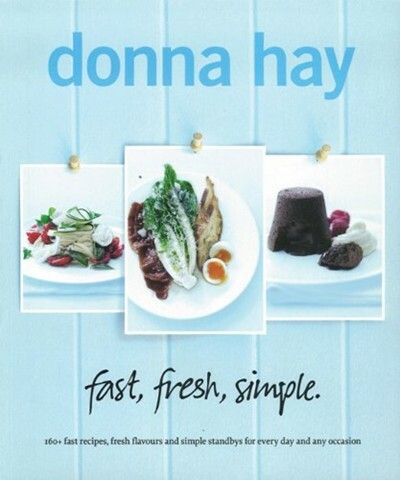 Donna Hay's new book, fast, fresh, simple., delivers more than 160 recipes. Donna has distilled her vast repertoire of shortcuts, tricks of the trade and ingenious ways to make simple, great-tasting and -looking food into one breakthrough cookbook, with a section devoted to achieving Donna's signature style. The "fast" chapter offers sweet and savoury options for cooks who need to deliver big results in the barest minimum of time. Home at six and dinner on the table by six-thirty? Donna's recipes are bound to save the day. In the "fresh" chapter, Donna looks to the classics and explains how to deliver all the flavour with none of the fuss of time-consuming preparation. She reinvents the classics and gives them a contemporary edge. If there is a short cut, trust Donna to have found it. In the "simple" chapter, she reveals how to take fresh produce and a few store-bought standbys and turn them into a collection of recipes that will become essential weapons in your culinary arsenal.